Organic beef stock bones to make your own stock or bone broth. The flavour beats a stock cube by a mile. A full-flavoured base for soups, sauces and stews – or you can savour a nourishing mugful straight up. Preheat your oven to its highest setting. Roast for about an hour until deep brown, turning once. Meanwhile, fry chopped onions, carrots and celery in a pan for 20-30 mins until caramelised. Stir in 1 tbsp tomato purée, then add the roasted bones. Cover with cold water, bring to a simmer, skim and add more cold water. Simmer, partially covered, for at least 4 hours - skimming from time to time. Keep in fridge below 5˚C, and use by the date on the label. 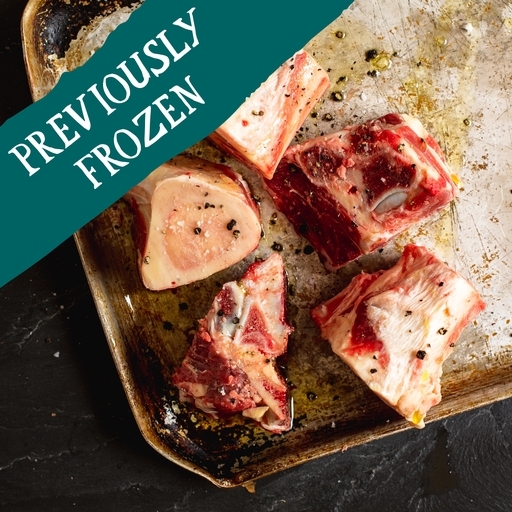 Pre-frozen, do not refreeze once thawed.